As I get into the car with Annie, she lunges at me, soaking my face in kisses as I giggle and dodge her six-inch tongue. She knows we are going to the B-E-A-C-H.
South Beach State Park, two miles up the road from our house, is a vast complex with a campground, trails, a picnic area, and a wide beach that extends from Yaquina Bay’s south jetty in the north to Seal Rock in the south. Cars with license plates from all over the U.S. and Canada fill the parking lot. Young men with surfboards struggle into their wetsuits, families gather up their beach towels, buckets and snacks and troop toward the ocean, and dog owners let their pets run free. On this day, fog coats everything in a silvery mist as Annie tugs me toward the surf. 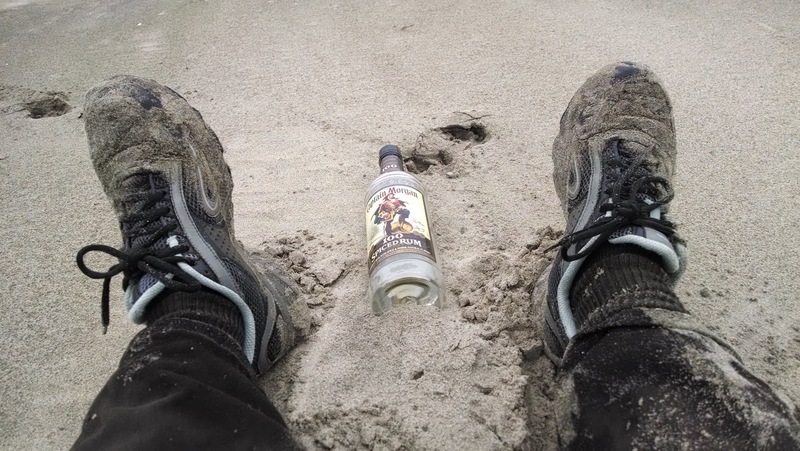 Like all beaches around here, it’s not easy getting to the actual sand. Some parks have rocks, some have long walks, and this one is steep, hard on my bad knees. But Annie helps, pulling me like a tractor. Our feet plunge into the soft sand as I scan the horizon for loose dogs. Mine tends to fight if another dog approaches so I keep her leashed and avoid confrontations. A couple large dogs to our left, tiny dogs to the right. We go right. Annie is excited, pulling as I stumble along behind her, letting her violate all the rules of dog obedience. The tide is way out. It feels as if we could walk forever and never reach the waves. The wet sand shines. Annie pulls hard. She loves water. “I don’t want to get wet,” I tell her. I’ve got good shoes and new jeans on. We come to a puddle. My massive dog (77.5 pounds at the vet last week) throws herself into it, moving her legs as if to swim, but it isn’t deep enough. “You goofy dog,” I laugh. We move on. Another puddle, another dip. Suddenly the ocean is coming toward us. The tide has taken a curve and the water, looking like a lace slip, zooms toward our feet. “Come on!” I yell. Annie and I run, but we’re not fast enough. Water and sand coat my good shoes and my new jeans. A handsome man coming from the opposite direction, also dodging the wave, laughs. “That was a surprise,” he says. “Yeah!” I gasp, still running. We walk on higher ground now, our eyes scanning the beach. The newspaper says people are finding lots of debris from the 2011 Japanese tsunami lately. Boats have washed up on our beaches, along with smaller items like bottles and plastic toys. But I don’t see anything today. Annie finds dried-up crab legs. Earlier in the year, she would have eaten them, but they must taste bad now because one after another she spits them out. I find only shells and rocks until, up ahead, I see something shiny and lead Annie toward it. It’s a bottle. Captain Morgan Rum. Empty. It’s too clean to have been there more than 24 hours. 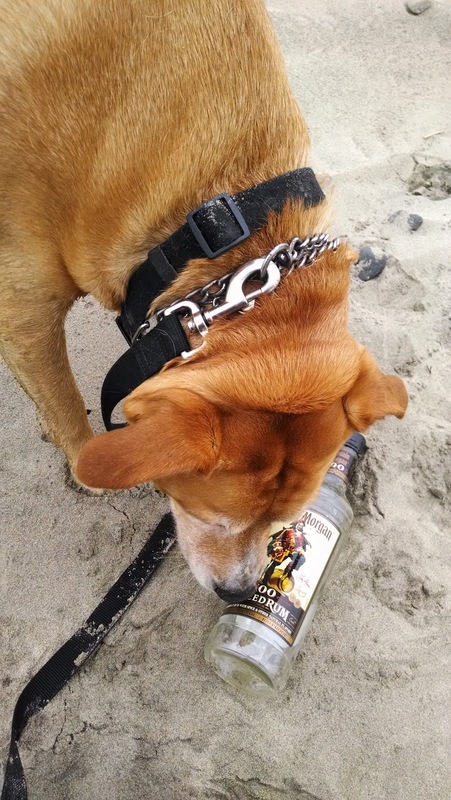 I collapse on the sand with my dog, take pictures for fun with the rum bottle, read its label. Spiced rum. Best with Cola or straight, it says. I wonder who drank it, who left it here. After a few minutes rest, we get up. I let Annie pull me up the sand toward the beach exit by the handicapped viewing area and the bridge that crosses a sea of beach grass. We’ll take the paved trail back to the car. Through the fog, I can see the upper curve of the Yaquina Bay Bridge. I hear the foghorn. I bring the bottle with me to deposit by the garbage can at the trail junction. The trail, which threads through trees and salal, with offshoots leading to the jetty and the campground, is usually easy walking, but today it’s full of bugs. Mosquitoes swarm around my face and hands and dot Annie’s tan fur with black. People I pass on the trail swat and curse at them. One guy runs back to his car for a can of repellent. If I had mine, I’d be putting it on. An itchy bump rises on my middle finger where I’ve been bitten. In 17 years walking here, I have never seen this. But it has been a weird muggy May with days of record-breaking heat interspersed with days of light rain. Global warming? Annie wants to explore every leaf and blade of grass. I pull her along through the mosquito cloud. In the car, sand falls from my pants and shoes onto the floor mat. Brown water drips from Annie’s wet fur onto the seat. Her golden eyes are bright with excitement, and she pants so hard it fogs up the windshield. I give her a hug and she licks my face. Oh, how we love the B-E-A-C-H.